A review in 10 words or less: "A tale of an annoying governess and maybe some ghosts?" First, a note on classics: not my favorite. I hate how that makes me sound. To be a prolific reader, do you have to enjoy the classics? It has just been ages since I actually enjoyed one. Authors back in the day seemed to use a lot of words. Like, way too many words that end up in long, seemingly run-on sentences. Example: "The story had held us, round the fire, sufficiently breathless, but except the obvious remark that it was gruesome, as on Christmas Eve in an old house a strange tale should essentially be, I remember no comment uttered till somebody happened to note it as the only case he had met in which such a visitation had fallen on a child." That was the first sentence of the story with 61 words. I almost stopped right there. 2) The beginning of the story is fantastic: the suspense of waiting to hear a story around the fire, and the way the narrator gets everyone hooked before the story ever begins. That part is genius. Suspense is invaluable when it comes to ghost stories. You have to make the reader believe in the threat, and James manages to pull that off pretty quickly. 3) Not to sound creepy, but scary, potentially evil children make for one great story. 2) "I love you...I hate you...I love you...I hate you..." Our heroine (or perhaps our villain??) can't seem to figure out if she trusts her wards or not. She seems entirely to eager to love them at the beginning and then becomes increasingly paranoid. And what's with the immediate infatuation with employer? Two meetings and you are head over heels? Come on lady. Get your act together already. Oh...and if you believe that the children you care for are in great danger, that might be the time to contact the object of your heart's affection for some help. 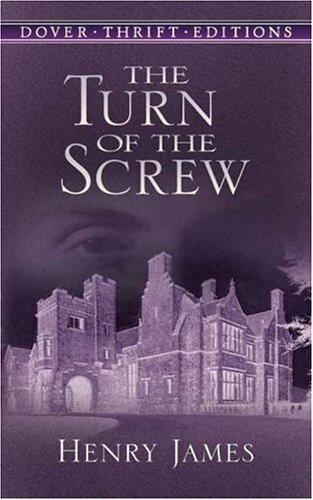 So there we go, my rather disjointed, random review for Henry James's The Turn of the Screw.